The vision of Uniquely Qualified Inc. is to revolutionize 1 million people in 5 years to pursue purpose by creating unique event opportunities to ignite passion, equip and impact. The Mission of Uniquely Qualified Inc. is to revolutionize 1 million people to pursue purpose. "You have already been qualified in a unique way. All you have to do is walk in your purpose." She believes you are Uniquely Qualified to walk into your destiny no matter where you are in life. Serving is her peace— Jacinda is the founder of Stolen Lunches, which is a nonprofit Global Bible Study Community created to inspire, motivate and empower people to strengthen their faith walk. She has a Bachelors of Science degree from the University of Old Dominion and a Masters Degree of Arts in Educational Studies. Jacinda is the Arena Host for the Charlotte Hornets. She also hosts the Sunday Morning Inspiration on V1019-FM. Both roles she works alongside with her husband and best friend, Derrick “FlyTy” Jacobs. She is the bonus mom of three boys and they share three dogs together. Jacinda is on a spiritual mission to impact the world for Christ. Diana Inspires is a Motivational Speaker, Strategic and Creative Brand Consultant, Certified Fitness Trainer and a Global Traveler. She is addicted to motivating, encouraging, inspiring and empowering others in Faith, and is on a mission to help people win in mind, body and spirit. 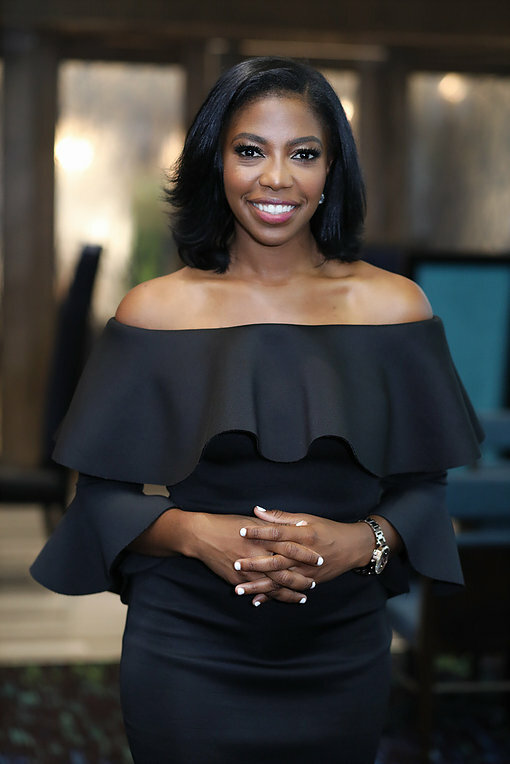 Destined to be the epitome of the phrase "living life to the fullest and with purpose", she made the leap of faith in 2004 from Jamaica to America in pursuit of a Bachelors' Degree in Management Information System at the University of Central Florida in Orlando. Soon after graduation, Diana pursued a 10 year career as a Senior Health Care Information Technology Consultant and Business Solution Architect. While on a business assignment in Singapore, destiny and circumstances collided and a world traveler was born. Having traveled to over 27 countries Diana’s love and appreciation for cultural exploration was cemented. This spurred her foray into curating unique travel excursions and destination wellness/empowerment retreats. These explorations taught her about the need for the woman to see herself holistically in both mind and body. On the heels of her time in Singapore, Diana was ignited with creating a safe space for women to share, laugh, and grow from one another’s testimonies and triumphs. It was through her creation of the Stolen Lunches Single Women’s Bible Study and Living Room Conversations platforms that Diana began to see her own life’s story take even further form. The loss of a relationship, health issues and being let go from Corporate America pushed her into purpose and Diana decided to fully pursue her passion of woman holistic empowerment. Melody McCord Stephens is a Connectivity and Recruitment Strategist, Inspirational Speaker, Coach and Author. Melody thrives to help people create and generate wealth by turning their network into their net-worth one connection at a time. She is the epitome of two phrases " connectivity is key" and "collaboration is the new currency." Melody is the founder of Yes Culture Inc. and encourages others all over the world to "just say YES", and to be confident and know that your gift will make room for you. No one can do what you do, like you do, when you follow God's master plan! Melody McCord Stephens has built multiple successful businesses using her skills and experience as a Connectivity Expert and saying "YES" to the opportunities presented to her. Over the years, she has garnered a wealth of knowledge and experience that assists business owners, event organizers, team builders, and those looking to expand their network. Her courses, workshops, and events are power-packed knowledge builders that equip participants from all industries to achieve their connectivity and recruitment goals! JOIN US AS WE TRAVEL THE GLOBE. GROW YOUR BRAND AND YOUR BUSINESS WITH UNIQUELY QUALIFIED. WE ARE NOT MEANT TO DO LIFE ALONE! WE HAVE UPCOMING TOUR DATES, SPECIAL EVENTS AND INTERNATIONAL EXPERIENCES. THIS MIGHTY GROUP OF WOMEN ARE READY TO SOAR! W are excited to partner with you. As we get ready for our upcoming confirm, give our tam 24 hours to partner with you.